A small-time Irish gangster's career is on the rise in prohibition-era Chicago. Breakout role for Jimmy Cagney, who completely owns this picture. 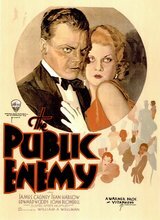 Originally, Edward Woods was cast as the lead, but director Wellman swapped the two. Pre-code, there is plenty of innuendo but the violence occurs off-screen.